After concluding his reflections on the Ten Commandments at last week’s General Audience, Pope Francis yesterday launched a new catechesis series focusing on the Our Father. Source: Vatican News. “The Gospels have given us a very vivid portrait of Jesus as a man of prayer,” the Pope said in the introductory catechetical instruction. Despite the importance of His mission, and the demands placed on him by the people, Jesus often felt the need “to withdraw into solitude and pray.” This was evident from the very beginning of His mission, after the initial success of his ministry in Galilee. “In some places in the Scriptures,” Pope Francis continued, “it seems that it is Jesus’ prayer above all, his intimacy with the Father, that governs everything.” This is particularly evident during the agony in the garden, before the Crucifixion. 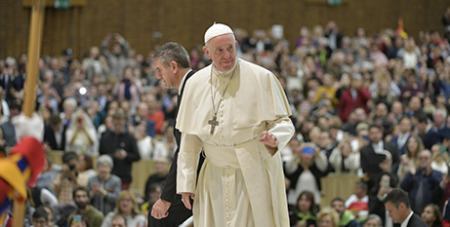 “Even if we have been praying for many years,” Pope Francis said, “we always have something to learn.” Recalling the parable of the publican and the Pharisee, the Holy Father said the first step in prayer is to humble ourselves before God. Pope Francis concluded his first reflection on the prayer of Jesus with the advice to repeat often, during Advent, the prayer of the disciples: “Master, teach us to pray.” If we do this, he said, then God will certainly not let our prayer go unanswered.